Check out the photos from the 2019 Central Valley Regional! The Eighth Central Valley Regional FIRST Robotics Competition will be held at Fresno Convention Center in Fresno, California, on Wednesday through Saturday , March 6 – 9th, 2019. The competition is an intense three-day competitive event showcasing robots built and operated by dozens of high school teams from all over the world. The Central Valley Regional is one of many FIRST Robotics Competitions held each year. These events are an exciting, multinational competitions that teams professionals and young people together to solve an engineering design problem in an intense and competitive way. The program is a life-changing, career-molding experience and a lot of fun. Each year the competition reaches more than 68,000 students on over 2,700 teams in competitions held across the USA and in other parts of the world. The teams come from Brazil, Canada, Chile, Israel, Mexico, the Netherlands, the U.K., and every state in the U.S. The competitions are high-tech spectator sporting events, the result of focused brainstorming, real-world teamwork, dedicated mentoring, outstanding innovation, and intense deadlines. Colleges, universities, corporations, businesses, and individuals provide scholarships to our participants and sponsorship for FRC teams. Involved engineers and industry leaders provide mentorship and expertise to help guide students through the engineering process. The competition shows students that the technological fields hold many opportunities and that the basic concepts of science, math, engineering, and invention are exciting and interesting. Free! The event is open to the public and no tickets needed! See baggage rules below. Hotel Purchases help support the regional! Certain items are prohibited from entering the venue. View full baggage details below. Schedule subject to change. All times are estimated based on flow of rounds. See Pit Administration for updated times. 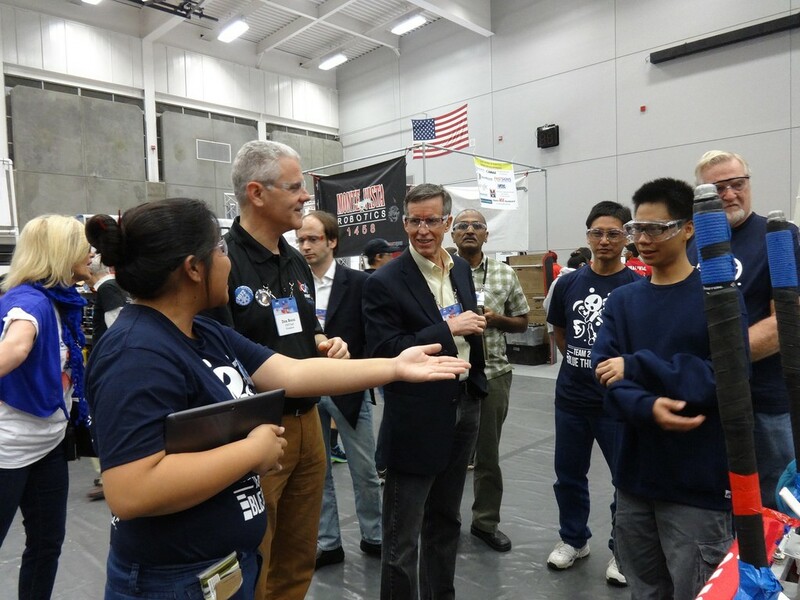 The Central Valley FIRST Robotics Competition is open to the public and is free to all. Bring your parents, friends, teachers, principals, and people that work in the many fields of Science, Technology, and Engineering to enjoy this great event. Come on by to see all the action and cheer on our future technology leaders. Imagine combining the action of a major sporting event such as football and the rhythm of a rock and roll concert, but with an engineering twist. The FIRST Robotics Competition provides an educational, engineering environment for students to learn skills that aid in future job placement. It brings together international teams made of students and professional engineers to overcome design and functionality obstacles. The FIRST Robotics Competition combines the competitiveness of life with the fun of learning. The Central Valley Regional has partnered with the Fresno / Clovis Convention and Visitors Bureau to aggregate hotels for our teams and volunteers. Hotel rooms reserved through the website below help the regional. Please reserve below! The list of prohibited items can be found here. If you are expecting guests, PLEASE be sure to make them aware of the policy. All bags will be searched when entering the venue. Outside food or drink is not allowed. Exemption: Cameras and video equipment will be allowed in the venue. Backpacks and other bags larger than the allowed will only be allowed into the venue during the initial load-in Wednesday night (6-8pm) and Thursday morning load-in, as well as the first half hour after the doors open to the public. 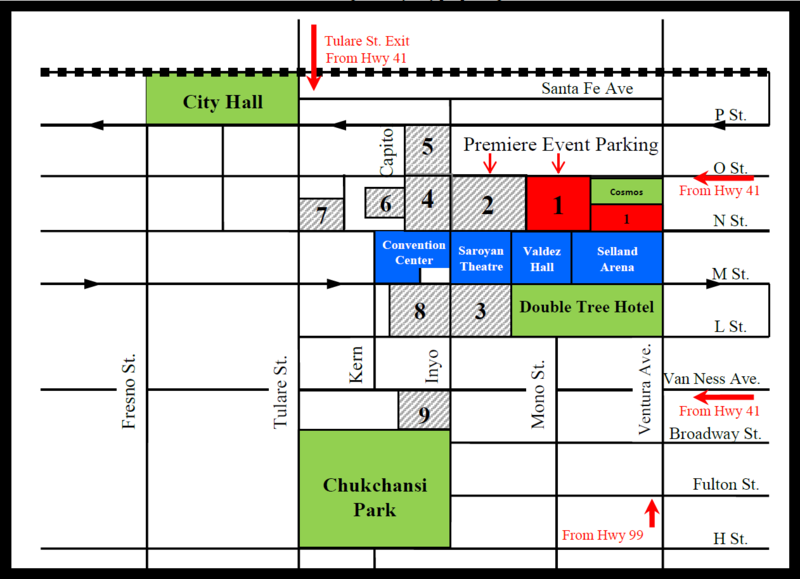 Please see the team / public entrance location on the venue map shown below. Once the initial crowd is inside, the standard bag policy will go in to effect. Backpacks allowed in during these times will be tagged for later entry (i.e. if you leave site for lunch and come back). Again, all bags will be checked every time you enter the venue, and only those tagged backpacks, etc will be allowed in after the morning opening of doors each day. Please be sure to share this information with every member of your team, parents and any other guests you expect to have at the event. If anyone associated with a team is expecting to bring in any bags that do not meet the requirements on the attached policy, they MUST be brought in during the stated times. If you have any questions, please reach out using the form at the bottom of the page, or click the orange “?” icon. Volunteers! Please see the email from the volunteer coordinator for baggage restrictions for volunteers at the regional. 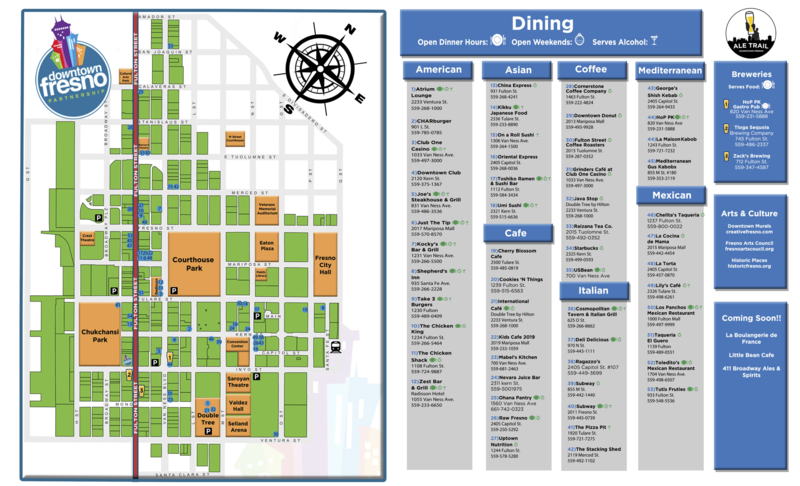 All volunteers should enter at the dedicated volunteer entrance per the Venue Map shown below. The map below shows the many parking lots around the venue. View the full PDF to see cost information. Teams should make arrangements with their hotel to store any trailers for parking. There will not be any overnight trailer storage at the venue. In the event of rain, the City of Fresno has graciously agreed to let us use the 4th floor of the parking garage located on Inyo Street for lunch. Please limit the space you use to 4 parking spots and leave the space cleaner than you found it. 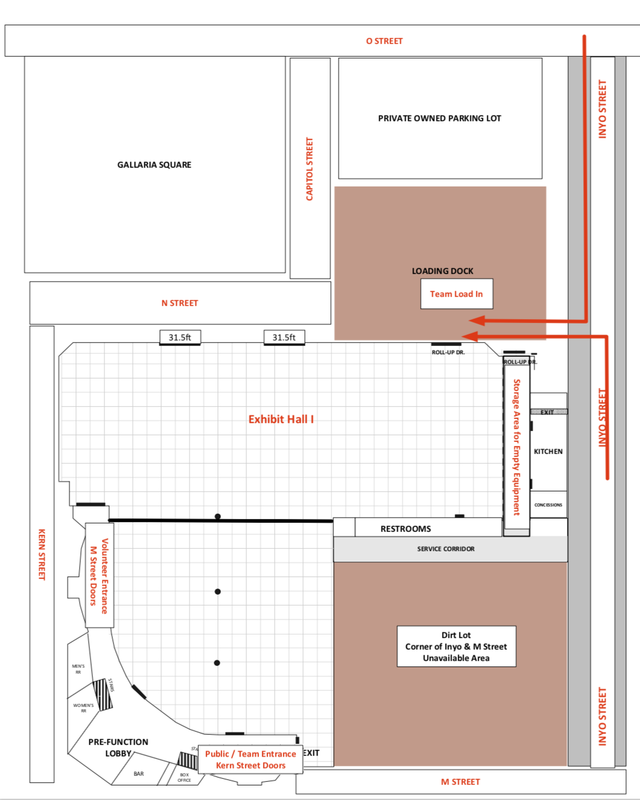 Teams will load in through the Hall 1 loading dock as shown in the Venue Map below. Teams will enter the loading dock from Inyo Street and exit on to N Street. Hot Dog w/ fries and small soda. Outside food and drink is not allowed inside the venue. Please plan ahead for meals. Please reach out to us for more details to discuss sponsorship opportunities and benefits. Click the button below to begin! Support our teams by volunteering at the Central Valley Regional! Being an event volunteer for the FIRST Robotics Competition is easy and there is no experience necessary. The time commitment is typically 1-3 days (Thursday – Saturday) as well as online training for certain roles. Some roles may require additional self study. Enrolling as a volunteer for the Central Valley Regional is a simple process. FIRST provides a portal through their website to apply for FIRST Robotics Competition events. All volunteers must register using this portal. Click here to access the Volunteer Dashboard. Note: As apart of the application process, all adult volunteers will need to fill out information required for an automated background check. For more information or to inquire about the process, please click here. For Events: Look for the Central Valley Regional. The screening process will take place after the first event registration. Please complete the screening process as soon as possible. The Volunteer Coordinator will not be able to assign you as a volunteer until the screening process is complete. The process typically takes 36 hours from when all information is submitted.